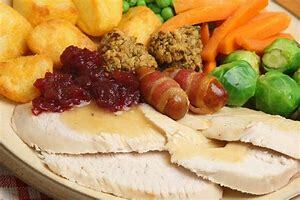 Us Brits think that Christmas dinner is a wonderful UK tradition. Well, we're wrong! It seems that the only part of Christmas dinner that is really British is the carrots, with everything else that glorifies our festive plate first found overseas. If we run across the meal - the turkey originated in North America and was brought back to the UK some time after the Pilgrim Fathers arrived there in the 17th century. The potatoes, were first found in South America and were brought to the British Isles in the late 16th century, while parsnips were grown first in the eastern Mediterranean. The origins of these and other festive foods will be explained by Exeter University's Professor Dave Hodgson, at a 'Science of Christmas' event in Falmouth in Cornwall, on Thursday of this week. 'Christmas dinner really is a truly global feast!' he is quoted as saying in the pre-event publicity. Pass me the Cranberry sauce will you, that must be British? It's American! !